All dryer ducting must be a minimum of 4" in diameter. Clean, unobstructed, frictionless ducts encourage air flow efficiency, quickens drying times, adds longevity to clothing's life and reduces utility bills. The DryerFlex meets the 4" diameter specs. Flexible transition hose between the dryer and the wall outlet should be either the foil type or the aluminum flexible duct (most preferred). Do not use the plastic or vinyl. Concealed ducting must be rigid metal (galvanized or aluminum) duct. Duct joints shall be installed so that the male end of the duct points in the direction of the airflow. Joints should be secured with metal tape (not duct tape). Do not use rivets or screws in the joints or anywhere else in the duct as these will encourage lint collection. Length of concealed rigid metal ducting shall not exceed 35 feet (25' for IRC). Deduct 5 feet from the allowable length for every 90 degree elbow and two and a half feet for every 45 degree fitting (the Dryer-Ell is an exception under 2006 IRC Section M1502.6, 2009 IMC Section 504.6.4 and 2009 IRC Section M1502.4). These lengths may vary per local codes and dryer manufacturers recommendations. Termination of dryer venting must be to the exterior with a proper hood or roof cap equipped with a backdraft damper. Small orifice metal screening should not be part of the hood or roof cap as this will catch lint and block the opening in a very short time. The hood opening should point down and exhibit 12 inches of clearance between the bottom of the hood and the ground or other obstruction. Tip to make it easier to attach Aluminum Flex: Flatten aluminum flex with pipe like dough roller, click here to see image, then check out this video for some great tips. 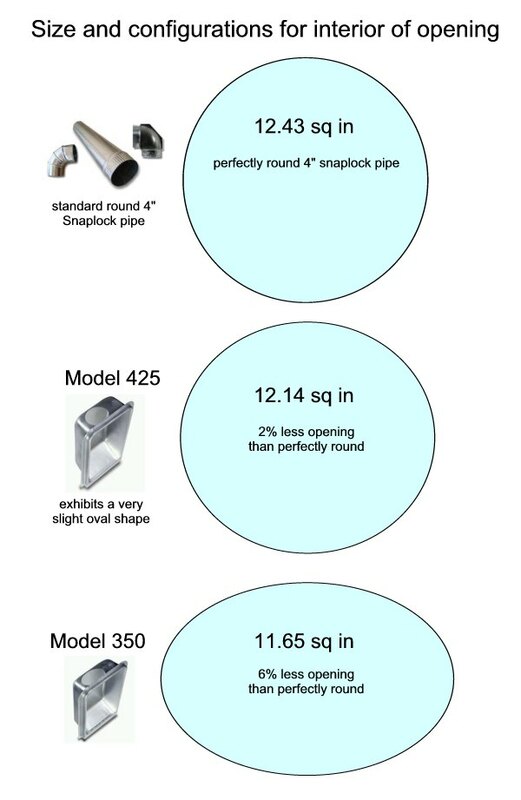 Comparison graphic of the port openings (round, model 425, model 350), click here to see image. Important tips for proper Dryerbox® installation—and avoiding pitfalls — can be found here. The importance of proper dryer venting can scarcely be overstated. Click Here for the latest fire articles tracked on the Internet. Actually inspect the termination port of the dryer and the wall or roof cap. Look for birds nest or clogged openings. Most importantly, feel for proper exit velocity of the air leaving the vent and look at or feel the interior walls of the duct. If you suspect clogged or partially clogged exhaust ducting, it is likely you need to have them cleaned. Dryer vent cleaning improves the safety and efficiency and depending on the venting circumstances, should be cleaned or inspected every 6-12 months. Make sure your flex transition hose is not kinked or crushed. The space behind your dryer should be sufficient as to provide adequate room for the flex transition hose to make its bends with minimal deflection and restrictions. Dryer vent cleaning is a very real commercial trade and the contracted work is sometimes described as Routine and Problem Cleaning. Routine cleaning is done from the outside by sending an air-propelled "jet-snake" through the vent. It blows air 360 degrees backwards, blasting the lint loose and blowing it outside. The lint is caught in a special bag. Problem Cleaning is performed when an individual dryer is not drying clothes fast enough. They disconnect and pull the dryer out, install a large blower on the vent, and blow, brush, vacuum and/or dismantle - whatever it takes to get the vent clean. Look in your Yellow Pages under Duct Cleaning or search the Internet. The use of the white vinyl flex pipe is all but completely prohibited, both by building departments and appliance manufacturers. Some municipalities allow or do not discourage the foil covered vinyl flex but almost all appliance manufacturers insist on the use of the aluminum flexible pipe. I have created a very useful comparison page. Click here to view it. Keep exhaust duct as straight and short as possible. Exhaust systems longer than the manufacturer's recommendations can extend drying times, affect appliance operation and may encourage lint build-up on pipe lining. More Dryer Vent Cleaning information can be found here. Great site dealing in all aspects of vent maintenance, cleaning and solutions. When running the clothes dryer, be careful not to overdry. Running your dryer too long not only wastes energy but can also damage your clothes. We recommend using an automatic setting, such as "less dry" rather than a timed setting. Clean lint filters regularly. Cleaning the lint filters on your washer and dryer will save energy, improve performance, and minimize fire hazards.